If I didn't have a strong view of whales before, I do now. A Whale of a Tale is a documentary feature representing the controversy surrounding Japanese whaling traditions in the small, rural town of Taiji, and it gave me a lot of conflicting feelings. A mixture of talking heads, handheld footage and thorough research, the film initially brings attention to a recent documentary, The Cove, in which a group of activists seeks to exploit and stop whaling in Taiji. Needless to say, it received a lot of backlash despite its critical acclaim, damaging as it was to the reputation of the Japanese tradition. A Whale of a Tale is Sasaki's answer to The Cove: produced in 2016, it is now receiving a US theatrical release for the first time. 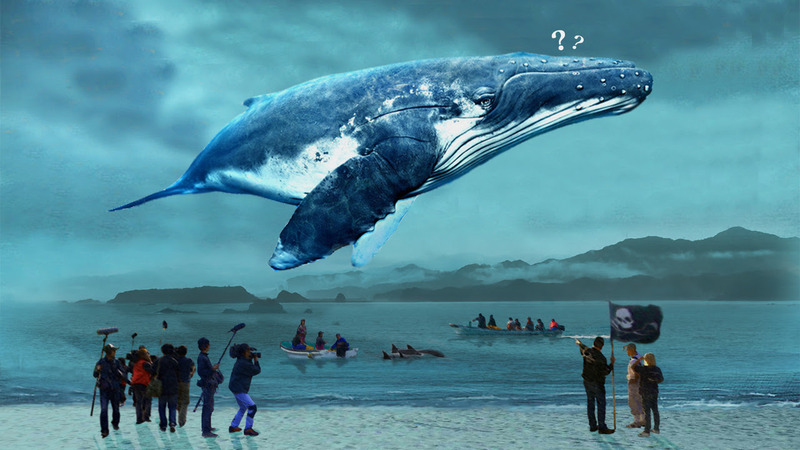 Mediated by an American journalist and long-time resident of Japan, Jay Alabaster, A Whale of a Tale tries to reconcile the conflicting points of view exposed by the controversy. While the film allows viewers to judge for themselves their verdict, the filmmakers have gone to lengths to try to balance out the arguments from both fishermen and activists, aiming to create a platform where each point of view is explored and discussed. It is, though, obvious that the film favors the Japanese way of life. As far as Jay is concerned, “the little communities are far more endangered than whales or dolphins.” What the film boils down to is a difference in discourse: the American media would freely label whaling as ‘murder’, ‘slaughter’, ‘inhumane’ and ‘evil’; whereas where the Japanese residents are concerned, whaling is a case of ‘sustainability’, ‘reverence’, ‘tradition’. It's tricky. As Jay points out (rightly so), tradition can often be used as a scapegoat. However, we are also presented with footage of Americans who treat the Japanese people terribly, harassing them for footage and behaving in a way that does not adhere to the Japanese moral code. It's easy to see that where the Japanese would always try to be polite and civilized, respectful in their cause, the presence of the American activists is jarring, even offensive. They made me pretty angry - much as they loved whales, I can't help but think how rude they were to come to another country and start tearing everything apart. Were they fighting for the right cause? Who can say? We are given a history of whaling in Taiji and it becomes clear that this small town has relied on the whaling industry for 400 years in order to survive and sustain itself. Being a small, infertile and difficult to access region, Taiji seems to have been driven by necessity to use whaling as a way to sustain residents. As a fisherman points out, hunting whales could serve multiple communities through food and other products. We realize that people's lives depend on this industry, which makes the whole issue much more complicated. The town’s devotion to the practice of whaling is also manifested through the presence of a whaling museum, established in the 1960s to be “the best whaling museum in the world”, and on top of this, annual whaling festivals where residents give thanks for the whales that have provided for them. To a Western audience, it might seem odd, but the footage really does invite us to think about the gray areas between hunting and showing respect for nature, especially when interviews from both sides reveal that this kind of conservation can be argued both ways. On the flipside, we are presented with images of politically aggressive (often American) activists, who would attempt to force a decline of the industry. They achieved this through media, which becomes a hot topic in the film. This documentary really effectively shows the way that media can distort and fragment the truth of a story, revealing just how difficult it is to show the full implications of a cultural debate like this. What really bugged me was that people who had no idea about the lives of the Japanese fisherman were so blase about making hurtful comments. When someone from a comfortable American background says "shame on your mother for giving birth to you! ", well, I think that's taking it a bit too far. If Jay has shown anything, it's that you need to understand people's lives before passing judgment. At one point, Jay must take a local fisherman aside and spend time explaining how many tweets can be sent and shared in a day, fuelling the fire against whaling. The man is visibly moved, realizing that the small-town traditions of Taiji are no match for the big guns of the media, and the message becomes clear: rise to the level of the media-savvy or wait for the inevitable decline of the industry, based on the perpetuated one-sided literature of pressure groups. I'll admit I didn't have a strong view on this issue prior to watching. But Sasaki definitely seeks to generate publicity of the controversy and to showcase both sides of the argument, and what's more, she was able to make me care about what's going on halfway across the world, concerning the lives of people I've never met. The amateur footage may at first seem off-putting, but in fact, it gets closer to the action than a glossy, polished documentary could have done. I can’t help but think of the sheer number of hours of footage that had to be accumulated in order to compile this research and to present the film - I would invite other viewers to consider this before launching into political differences. While environmental issues remain widespread, A Whale of a Tale shows that there is often no easy solution, as action taken on both sides can have long-standing consequences. What the film does achieve, though, is a careful look at the conflicting worldviews of American and Japanese residents, and how these cultural differences can be an obstacle to people's livelihoods. Will I now go out and campaign to save whales? Maybe not, but it made me think twice about the people involved in both sides of any argument, and how anonymous comments on social media can be really damaging. Moral of the story: choose your battles wisely and think about the others involved.